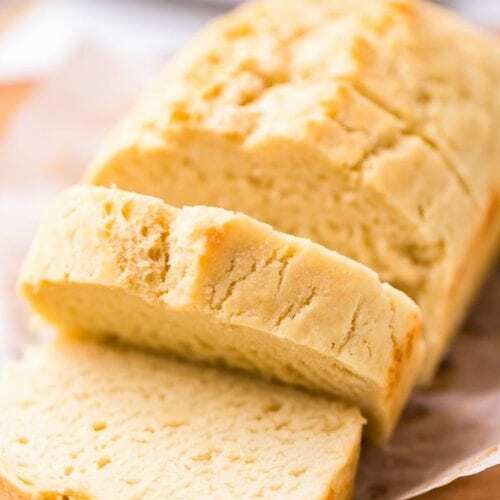 Nothing is better than homemade bread, right? English Muffin Bread, Rosemary Bread or even some yummy Homemade Breadsticks the whole house smells great when it’s baking BUT homemade bread takes forever, right? Well no more! 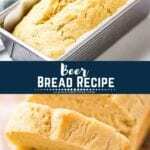 Beer Bread is quick and easy to make! I always bought the prepackaged boxes that you added beer to and poured butter over the top. Obviously making your own was much more labor intensive right? Not so much. Like maybe an extra 5 minutes of labor. Totally worth it. Plus whenever I needed a box of it, you guessed it, I never had it on hand! Typical right?! Even I can carve out an extra 5 minutes in a day to make homemade beer bread. Trust me if I could you can too! If you are scared of making bread because of dealing with yeast I have good news for you today. 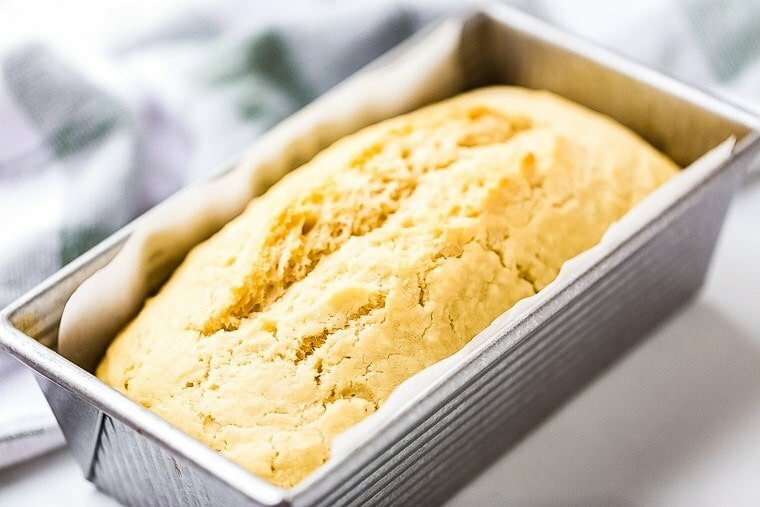 This Beer Bread does not require yeast so don’t fret that! This recipe is virtually fool proof so quit being afraid of making bread! I love the texture of beer bread. It’s slightly dense and hearty but yet still moist and delicious. I love dipping it into my favorite Garden Vegetable Spread or Dill Veggie Dip. The combo of this homemade beer bread and the spread or dip is perfect when I have a girls night. It’s not to heavy, yet filling and easy to munch on while we have a good gossip session! 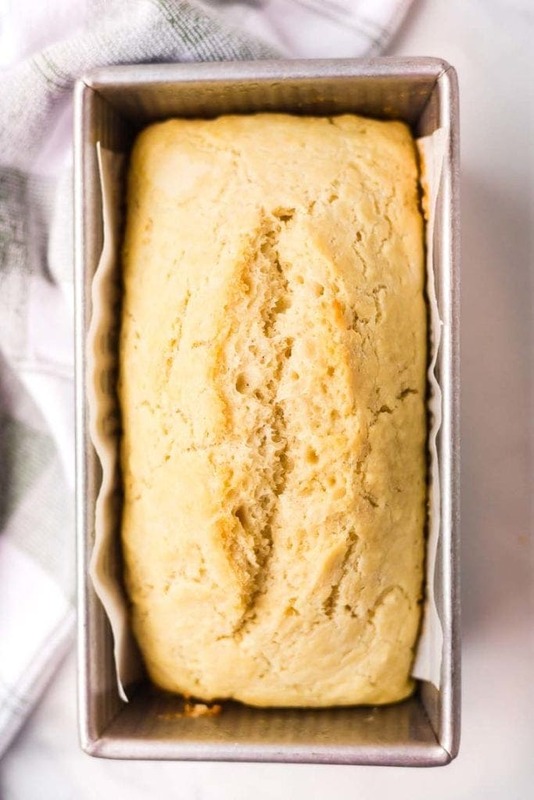 But, ya know, I’m totally fine with you making this bread recipe just because you are craving it, topping it when it’s still warm with a slab of buttery and enjoying it that way too! Here are a lot of my most frequently asked questions when someone is making this Beer Bread recipe. Hopefully these will help you if you have any questions otherwise comment below and I’ll do my best to help you out! How does beer bread work? Well, science was never my strong point, but trust me when I say the yeast in the beer interacts with the sugar. It helps the bread to rise and become the most delicious loaf of homemade bread. Bonus? Five minutes takes you right to bread heaven! Does beer bread taste like beer? Yes! Buttery, thick, rich beer and it’s delicious! I would think this goes without saying but just in case… you can’t get drunk by eating beer bread. You can, however, make the BEST sandwiches with this bread. 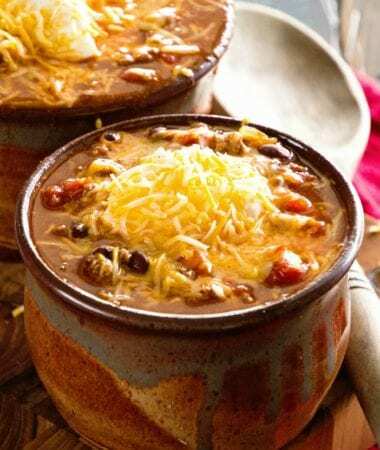 It’s flavorful and rich – just add a stack of thinly sliced roast beef or chicken and enjoy! The beer will enhance the flavor in the bread. If you like a good stout, use Guinness or Sierra Nevada Narwhal! If you prefer a pale ale, try using a Coopers Pale Ale. In other words, use your favorite! Is there a substitute for beer? Yes if you don’t have any beer on hand, you can substitute with ginger ale. See, you have all of these ingredients, right?!! Combine flour, sugar, baking powder salt and beer in a large bowl. This will be sticky. Place dough in a greased 9×5 inch loaf pan. Pour melted butter on top. Bake bread in preheated for 50-60 minutes. 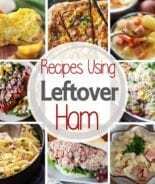 More of my favorite bread recipes! I know you’re going to love this and everyone will love it! Be sure and comment below with a five star rating so I get to hear what you think!! 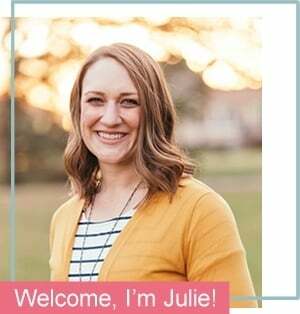 Don’t forget to tag me on Instagram @julieseatsandtreats or #julieseatsandtreats that way I’m sure to see your pictures!! 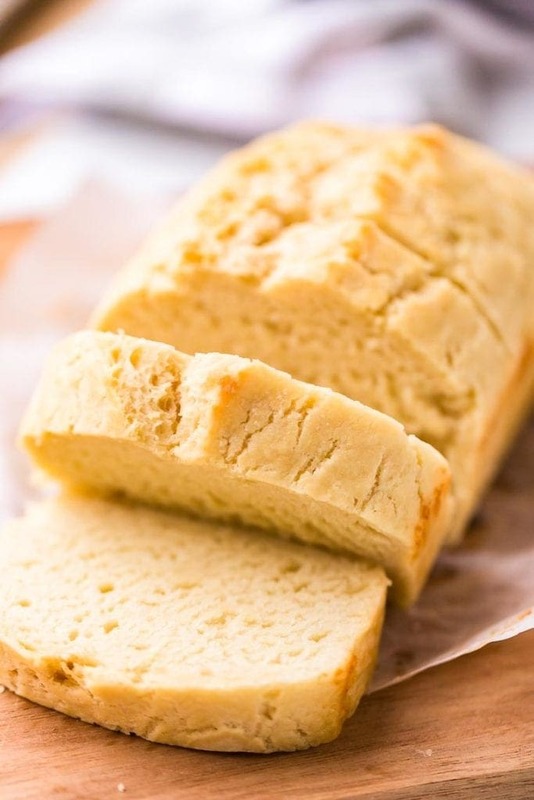 Quick and easy homemade beer bread recipe that only requires six ingredients! Bake bread in preheated oven at 350 degrees for 50-60 minutes. No more box? I’m down. 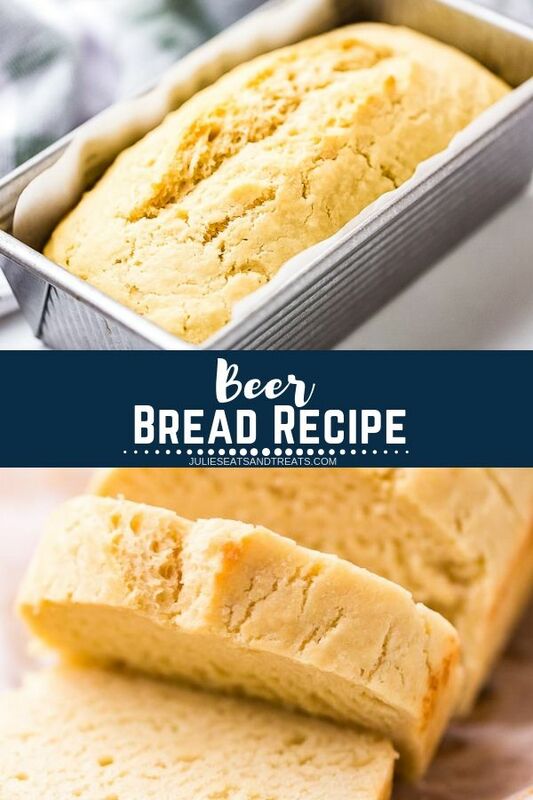 This beer bread looks wonderful. So easy, right? I take the TOTAL cheaters route and use self-rising flour so that it is even EASIER! 🙂 Pinning! I love beer bread so much! It is crazy easy and crazy good! Yours is baked perectly! This looks delicious Julie! One of my good friends from Austin makes the best beer bread. We now live in Colorado and I miss it terribly. I’ll have to give this recipe a try. Thank you for sharing!! I hope you enjoy it Monet! You and me both! I couldn’t keep my fingers off of it! I love beer bread with beef stew. 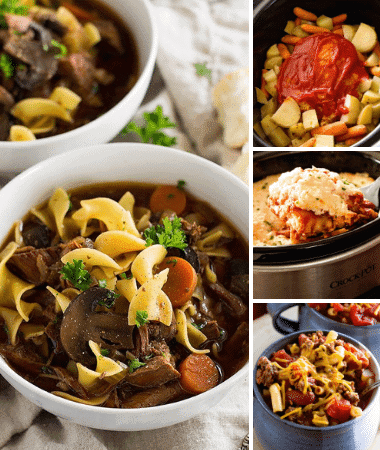 This is perfect for the coming cooler months! Now I really want it to cool off!!! Mmmm, my husband would love that! 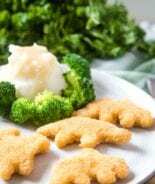 I gotta make that for him, it just looks so delicious! It’s about the only kind of bread I make! What kind of soda do you use instead of beer? I’ve heard Ginger Ale would work? do you think this could be made with King Arthur Flour – glutenfree multi-purpose flour? I would guess it could be but I’ve never done it that way so I can’t guarantee anything! Mmmm, I’m just imagining how amazing this tasted!! I can’t believe how easy it was to make! I’m definitely giving this a try!! Do you need to let it rise like regular bread dough? Someone mentioned using self-rising flour so not sure if I can just stick it in the oven after mixing w/regular flour or not so much? Thanks for posting! Nope just stick it in the oven and you are good to go! 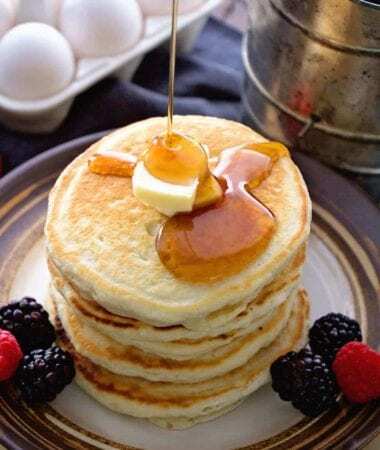 No rising…that’s why I love this recipe! I made your beer bread with our dinner tonight and can I say this is now the only beer bread recipe I will ever use from now on?? 😉 So good & WAY better than those boxed beer bread mixes! 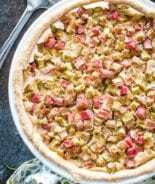 Would you have any other recipes for non-yeast bread? I love baked bread, but do not bake it myself because you need yeast in it. I do not have the patience for waiting for the bread to rise. I have quick breads that are sweet but nothing that isn’t sweet! It’s me again Sandy. I wanted to give you a update on the beer bread that I made yesterday. The bread 🍞 itself turned out perfect. I was disappointed though in the flavor. 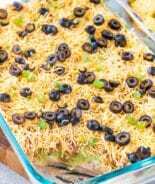 Is there some kind of seasoning I might add to the recipe to make it more flavorful? 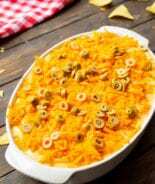 I am going to give this recipe another try with some seasoning added to it. I was hoping you could give me some suggestions to that. Thank you again Julie for the recipe. Love Beer Bread and nothing smells so wonderful as fresh baked bread. This looks so soft and tender! Will I get the same results using soda instead of beer? Hope so! You can sub ginger ale for beer and it will be almost as good!